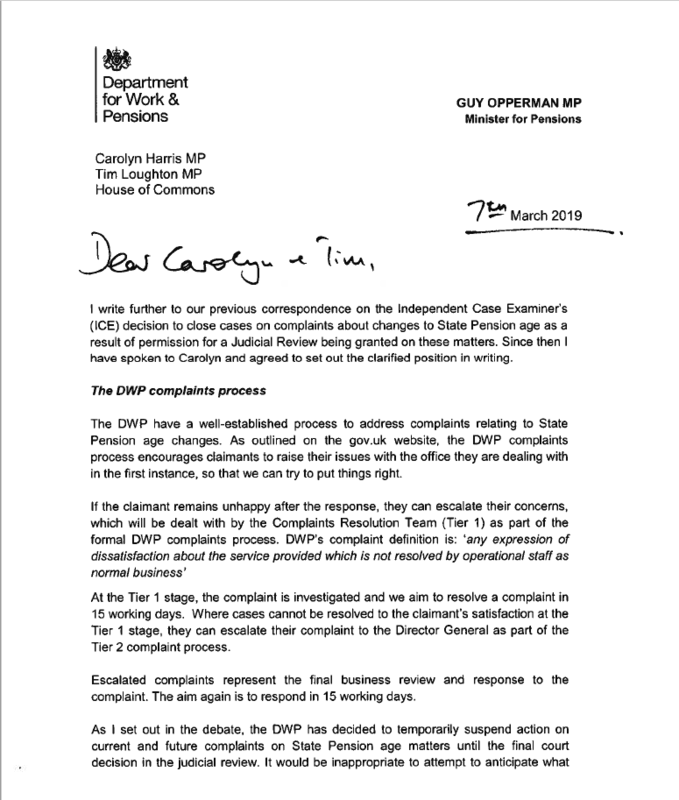 The Chairs of the APPG on State Pension Inequality for Women have received a further letter from Guy Opperman MP, Minister for Pensions clarifying the process of the DWP complaints, the Independent Case Examiner and the Parliamentary and Health Service Ombudsman, in light of the Judaical Review. A full copy of this letter can be seen below. 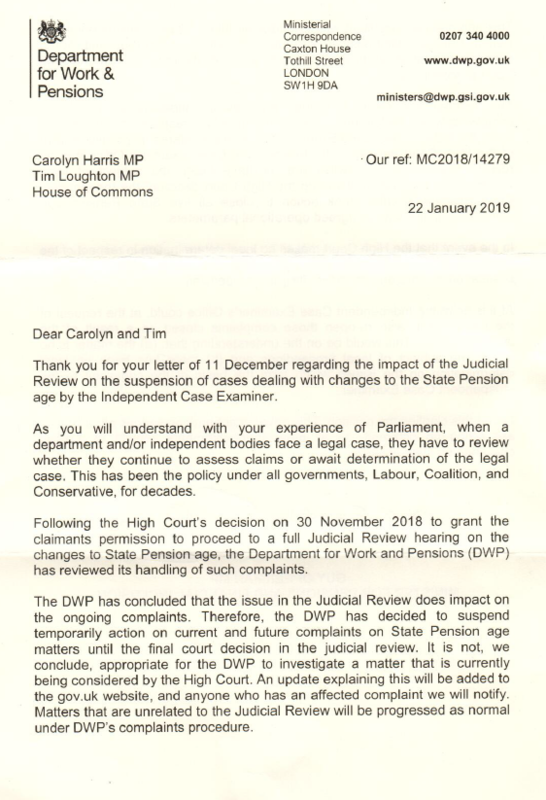 Carolyn Harris MP and Tim Loughton MP wrote to Guy Opperman MP, Parliamentary Under Secretary of State for Pensions and Financial Inclusion at the Department for Work and Pensions, in their capacity as Co-Chairs of the APPG on State Pension Inequality for Women. 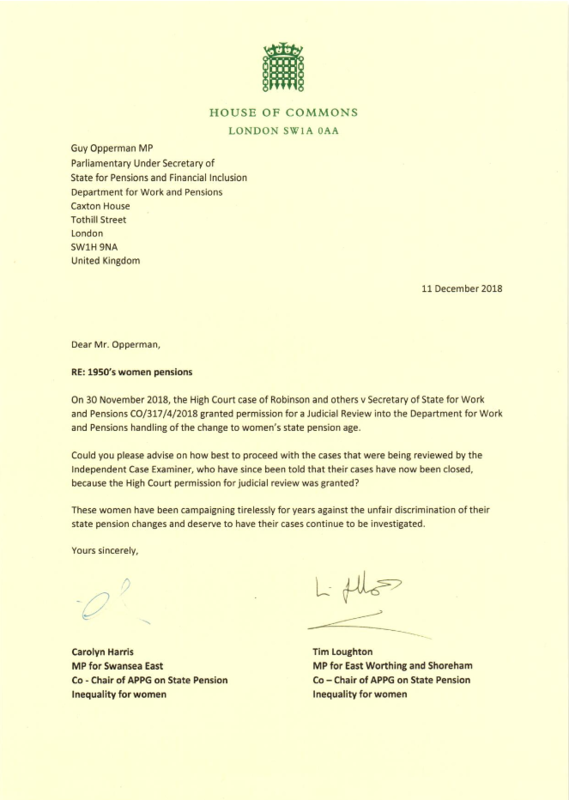 In the letter they asked how 1950s women pension cases, which were under review by the Independent Case Examiner, can continue to be reviewed. These cases have been closed as a result of the High Court granting permission for a Judicial Review into the Department for Work and Pensions handling of the change to women’s state pension age. A copy of this letter is below. 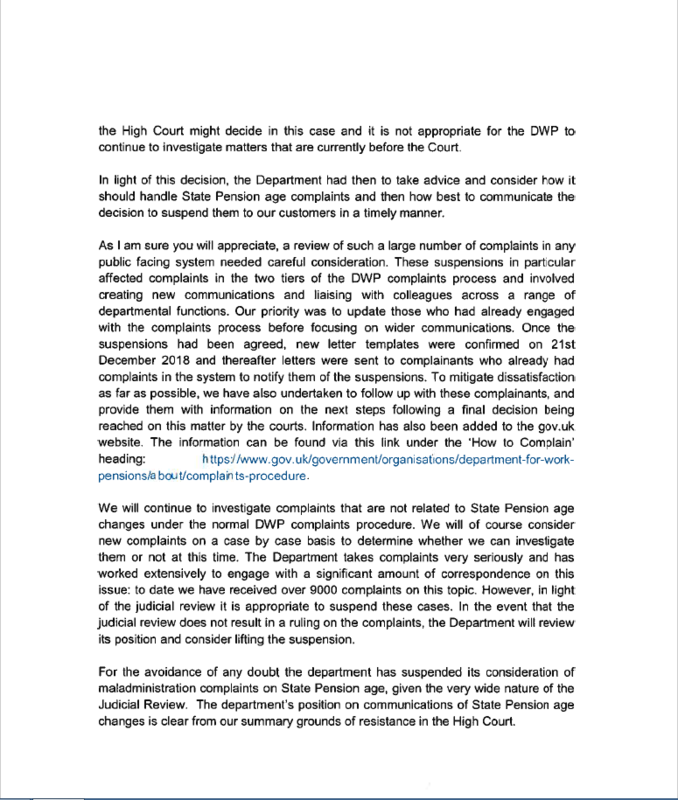 We have now had a response to the letter which clarifies that the DWP have temporarily suspended action on current and future complaints until the final court decision in the judicial review. 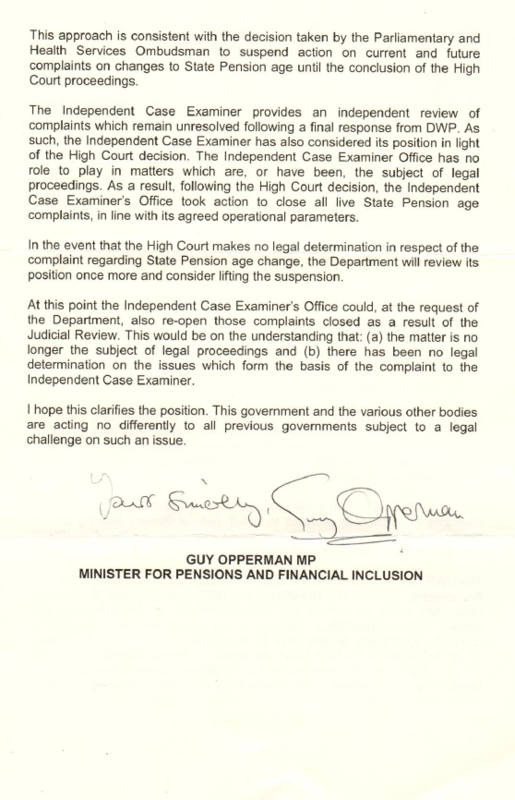 It also shares that the Independent Case Examiner has closed all live State Pension age complaints. We are seeking a meeting with Guy Opperman to discuss this further. Carolyn Harris MP (CH) opened the meeting and welcomed all of the attendees and started the AGM. CH and Tim Lougton MP (TL) shared that they were happy to remain as Co-Chairs of the group and were re-elected to these positions, unopposed. All of the other Officers of the APPG were re-elected unopposed to their positions. CH and TL then provided an update on the Pensions (Review of Women’s Arrangements) (No. 2) Bill 2017-19, which is still waiting to be scheduled in the House of Commons. He shared that there is a backlog of legislation waiting to be scheduled so it may take a while. There will be four extra sitting Friday’s so they will try and get the Bill scheduled for then. It was clarified that the objective of the APPG was the private members bill. Actions – a copy of the Private Members Bill is to be circulated among the group, with the report published by the House of Commons library. He confirmed that neither the consultation, or this meeting, had given preference to any one group and that each group that responded to the consultation had been treated equally being allowed one representative (in the case of WASPI, one representative nationally and not one from each of the local groups that responded) in attendance. He referred to the criticism that had been targeted at himself, Carolyn Harris and other APPG Members both directly and via social media and advised that this was detrimental to the cause. He requested support going forward and a more unified approach. Carolyn Harris (CH) outlined the rules of the meeting. She advised that no photography, filming or audio recording were allowed in the room. She explained that a statement would be added to the APPG website detailing the outcomes of the meeting and that full minutes would follow in due course. 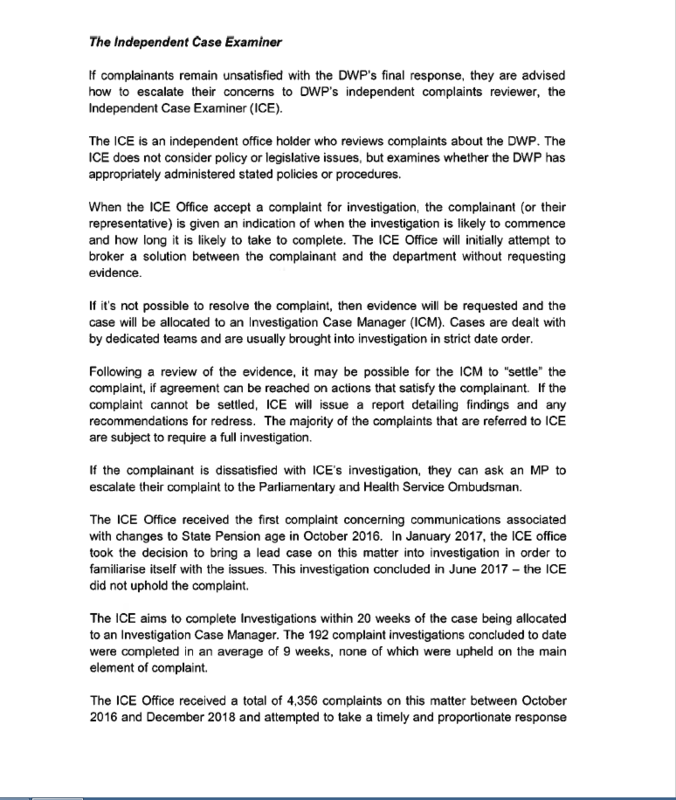 She made all present aware that any breach of the rules or any reports/minutes shared aside from the official ones published on the APPG website would be reported. CH advised the women that on recent campaigns that she had led on, positive attitudes and comradeship had been the key to success. She suggested that the biggest threat to justice for 1950s Women was the in-fighting between groups which was unhelpful to both the APPG and the campaign as a whole. Nancy Platts (NP) shared copies of the report with all those present and advised that additional copies would be placed in the House of Commons and House of Lords libraries, as well as online, so that it can be viewed by anyone with an interest. She summarised the contents of the report, explaining that all groups had been allowed to participate and 118 responses had been received. The responses had included a variety of disparate views but all responses had been given equal consideration and treatment. Being forced to stay in unsuitable jobs or lack of access to new jobs, training or Job Seekers Allowance. Many found the workplace to be unwelcoming for older women and some of the processes to be humiliating. Ill health affecting women’s ability to continue working, particularly in physical jobs, and the resulting stress and anxiety of this. NP confirmed that the report also took into consideration the different and specific issues faced by women living abroad (only one group of this nature – WASPI International – responded to the consultation) as well as the variation in payments received by different women depending on the number of years of National Insurance contributions they had accrued. NP explained briefly about how the Bill itself would work, advising that it would ask the Secretary of State to review pension arrangements for women affected by the Pensions Act changes but that it could not ask for anything with cost implications. It would therefore request that the government look at the financial impact on women, undertake a costing exercise on transitional and longer term proposals and propose a solution to benefit as many women as possible. CH advised that the second reading of the Bill had been deferred (originally tabled for Friday 27 April) as it was too far down the list to be heard on the day. She confirmed that the new date had been set for Friday 15 June but that it was likely to be deferred again, with the intention of getting it either first or second on the list, to guarantee a debate. CH made it clear that if any groups chose to make a legal challenge for compensation at any point, the APPG would be forced to fold and the Bill would be pulled. The floor was opened to attendees for questions. Mary Lawson (ML) asked for clarification on CH’s point about legal challenges. CH explained that she was referring to legal challenges for compensation only and not internal legal issues within individual groups. Christine Williams (CW) questioned whether women would be able to choose not to take up an offer if it would be detrimental to them – for example if a decision were made to offer reduced pension for life with an earlier start date. CH advised that the final proposals would be based on helping the majority not individual cases, and would be unlikely to be optional, but reiterated that the recommendations (as set out by NP) did not include early reduced pension. Mariana Robinson (MR) asked why women born in the 1950s could not just automatically receive their pension on their 63rd birthday, with the timetable for delaying eligibility taking effect only for women born from 1960 onwards. It was felt that these women had had more time to prepare. CH explained that the Government would not accept this and reiterated the need to ensure proposals in the Bill be realistic. Frances Coppola (FC) questioned the ‘1950s Women’ branding. She suggested that women born in the 1960s as well as men born in the 1950s were also struggling and anticipated a need for help for all those affected by the changes to the Pension Act. CH advised that whilst the APPG understood this, time was limited and therefore there was a need to progress with the work already underway to try to help 1950s women. Wendy Eachus (WE) asked about the deferral of the Bill as she had heard it would not be heard until February. 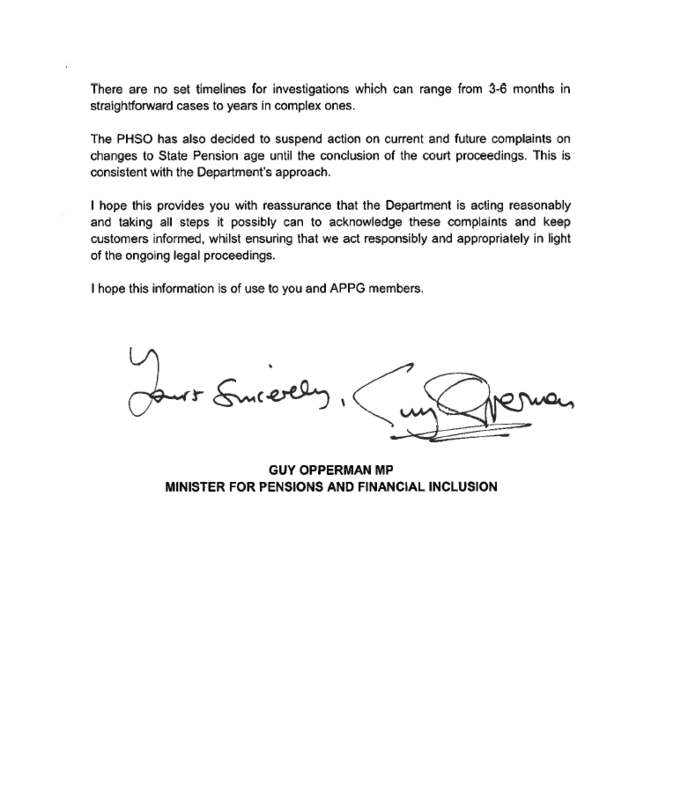 CH advised that this was a different Pensions Bill that Peter Bone MP was proposing. WE asked for some clarification on how long after the second reading of the Bill changes could be implemented. TL explained that if the proposals were to get to voting stage, there would be a reasonably good chance of getting them agreed considering the number of Members from all parties supporting them. He added that the biggest obstacle was getting the opportunity to have the vote. He continued to explain that the two ways of getting a vote to make changes were a Private Members Bill (PMB) or by putting in amendments to a Government Bill. Twenty PMBs get allocated via a ballot for each session of Parliament and these take priority (first to be heard on sitting Fridays), but cannot be used for anything which has financial implications (TL was successful in the ballot but could not use his PMB for 1950s Women’s Pensions for this reason). All other PMBs have to rely on being high enough on the list to be heard on sitting Fridays. TL advised that this was a long shot but was the reason behind deferring the second reading. With a Government Bill, the whole House would be given the opportunity to vote on amendments and TL felt that if this were to happen, APPG Members would stand a good chance of being able to gather enough support from colleagues to win the vote. TL advised that it was not possible to provide any timescales and reiterated that there were no guarantees that it would ever get to voting stage. He added that the process would have to be complete by May 2019 (end of the current session of Parliament) for any changes to legislation. Yvonne Fovargue (YF) added that only one PMB could be in committee stage at any time so this could cause further delays following the second reading. Doreen Smulders (DS) asked for further clarification of the three proposals that the APPG were suggesting. CH explained again that the proposals were equalisation so that all women receive full state pension, transition payments for all women from age 63 and additional pension credit for those in the greatest need. ML asked about the group of women disproportionally affected by the timetable of changes (those born in late 1953 and 1954). She suggested that despite being the worst affected, by the time any potential changes are approved, they may already be eligible for their pension and therefore will not benefit from any of the proposals. CH accepted this but explained again that the only option was to try to help as many women as possible within the confines of parliamentary procedure. She suggested that they could seek compensation separately, but that widespread compensation would not be part of the proposal. ML suggested a cost of £1.3billion to ‘put things right’ and ensure women would not have to wait disproportionate lengths of time for their pension. However, TL questioned the accuracy of this and confirmed that no official figures were available to support this. DS voiced the opinion that all the deliberating and lack of decision making was affecting those with the greatest need. She suggested that all groups should accept that there would be some who would not benefit from the proposals as much as others but that the priority should be reaching an agreement to help those that needed it most as quickly as possible. FC agreed with DS and urged others to support the proposals and discuss the detail at committee stage. Mary Kirby (MK) asked for clarification of how the ballot process worked for PMBs. CH explained that this was a Public Member’s Bill as it had not been allocated via the ballot. She added that all MPs could enter the ballot for PMBs at the start of a session of Parliament and the allocation was drawn at random. Those that were not successful then had the option of applying for Public Member’s Bills or Ten Minute Rule Bills. However, she did explain that PMBs take preference on the order paper for being heard. Joanne Welch (JW) began passing notes to other group representatives who had spoken. She then asked the Chair (CH) to read a note that she had passed to her. CH refused but offered JW the opportunity to read the note herself. JW suggested that the consultation had been biased but was assured by CH and TL that it had not been. At this point JW became disruptive and refused to listen to the response from CH and TL and was therefore asked to leave the meeting. Jane Loxley (JL) thanked the APPG for their work on the consultation, report and Bill. This was supported by the majority of those present. She agreed with others that whilst the proposals would not help everyone, they were a step in the right direction. She reiterated the comments of DS and FC that groups should unite in order to speed up the process for those that needed it most. Karen Connell (KC) thanked the APPG and outlined the difficulties and humiliation some of her group were facing trying to find work or having to apply for Job Seekers Allowance. CH explained that this was the reason behind the proposal for transitional payments from age 63, so that women were not forced to find work or sign on at this stage in their lives. 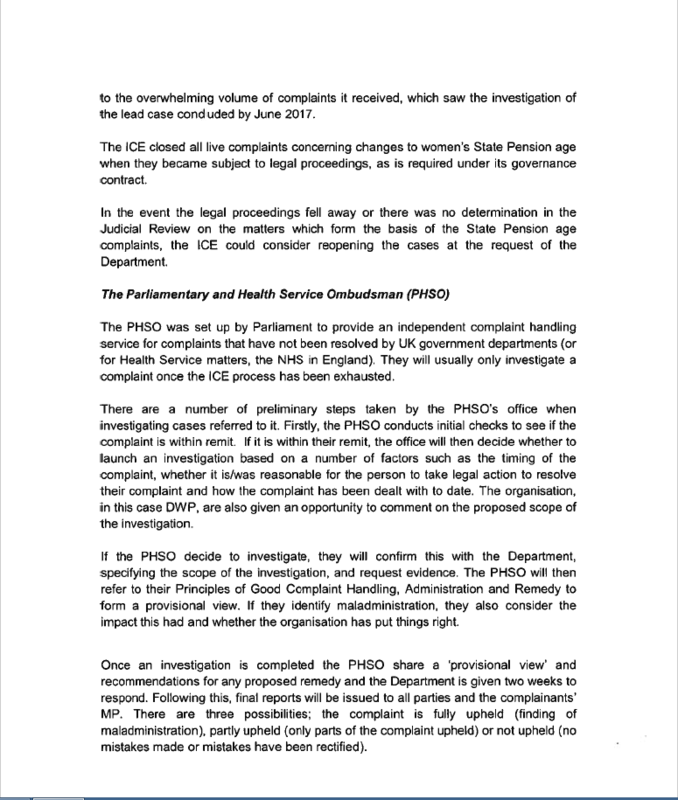 Yvonne Howard (YH) voiced her concerns that process and procedure was such a rigmarole that there would be no positive outcome to this. CH agreed that this was a worry but that the best hope of getting things implemented was to have agreement from everyone which would allow the APPG to try and make progress. Debbie De Spon (DS) agreed that things needed to progress as every delay meant more women were eligible for the pension without having benefited from any of the proposed support. Jane Tombling (JT) confirmed that the members of her group were completely supportive of for the work the APPG were doing and would be grateful for any financial support that may be made available. May Low (ML) apologised for the confusion about who would be representing WASPI Ltd at this meeting. She agreed with others that everyone was facing the same difficulties and that working together was likely to produce the best outcome for all. Trudy Baddams (TB) was very supportive of the transitional payments for all, without assessment and felt that this would be a perfect solution. James Frith (JF) voiced his support for 1950s women. He referred to another APPG that he was a member of which had lost sight of its end goal and nearly ended up without anything it had been campaigning for due to differences of opinion from those people it had been set up to support. He reiterated the message that a unified approach was the best approach and urged the groups to work together for the good of all affected women. CH closed the meeting. She accepted that the proposal was not an ideal solution for all but advised again that it was something that the APPG stood a realistic chance of achieving. DS suggested that all group representatives present should indicate, by a show of hands, whether they supported the proposals. CH and TL noted the unanimous support for the proposals and announced that they would report this back to the APPG and proceed with the second reading of the Bill accordingly. There was no objection to this statement. On the day after the meeting, Mariana Robinson contacted Nancy Platts to say that she had abstained from the indication of support but this had not been made clear at the time of the meeting. Following the meeting, Debbie de Spon contacted Carolyn Harris to say that she had abstained from the indication of support but this had not been made clear at the time of the meeting. The forthcoming meeting between APPG Officers and group representatives is strictly by invitation only. Please do not make travel arrangements if you have not been formally invited as only invitees will be granted access to the closed meeting. Details for the meeting between APPG Officers and representatives from 1950s Women’s Groups are being finalised. This will be a closed, private meeting and only those who are officially invited will be allowed access, as we are restricted on numbers. Invites will be sent to one representative from each of the groups that provided details to the consultation. A decision has been made to postpone the second reading of the Pensions (Review of Women’s Arrangements) (No. 2) Bill. As the Bill had dropped to number 6 on the list for the day, it would be highly unlikely that it would be heard. A new date will be announced for after Summer Recess in due course. The Bill is prepared but we would like to ensure that we find a suitable date when the Bill can be debated on the floor of the House. The All-Party Parliamentary Group on State Pension Inequality for Women met on Wednesday 24th January for a preliminary presentation of the findings from their consultation with groups representing 1950’s born women affected by changes to the State Pension Age (SPA). The consultation was set up to help identify a solution that will address the ongoing concerns raised by 1950s-born women. Over 100 groups took part and gave powerful illustrative examples of the difficulties women are facing financially and personally. The APPG will produce a report outlining our proposals and invite representatives to a meeting in Parliament ahead of the Bill coming up for debate on 27th April 2018. The All-Party Parliamentary Group on State Pension Inequality for Women wants to identify a solution that will address the ongoing concerns raised by groups representing 1950s-born women affected by state pension changes. To do this, we are inviting representatives of any group that campaigns for those women, to take part in a brief consultation. Your group representative will need a password to access the consultation and this can be obtained by emailing appgwpi@campaigncollective.org who are conducting the consultation on our behalf. Please note that this consultation is open only to the official representatives of campaign groups for 1950’s-born women affected by changes to the state pension age. We are unable to accept responses from individual members or other groups. This consultation closes at 5pm on Friday 22nd December 2017. Once all the responses have been collated and analysed; a report will go to a meeting of the APPG in January 2018. We will then be drafting a Bill that will require the Government to establish a formal review of pension arrangements for women affected by changes made by the Pensions Act 1995 and the Pensions Act 2011. This Bill is currently scheduled for debate on 27th April 2018. Please do encourage your group representative to contribute.